Which cars models are fit for E15? In 2011 the Environmental Protection Agency (EPA) approved E15 — a 15 percent biofuel blend — for use in model year 2001 and newer cars, light-duty trucks and medium-duty passenger vehicles (SUVs). E15 is the most tested fuel for commercial use in American history. The EPA’s stamp of approval to use E15 in vehicles 2001 and newer is based on several assessments of vehicle durability. They considered results from the Department of Energy (DOE) Catalyst Study and other test programs, along with the EPA’s own engineering assessments of vehicle technology advancements since 2000. That decision means that today nearly 9 out of 10 American vehicles are approved to use E15 by the EPA. Automakers are also allowing and warranting the use of this lower-cost, higher-octane fuel blend. 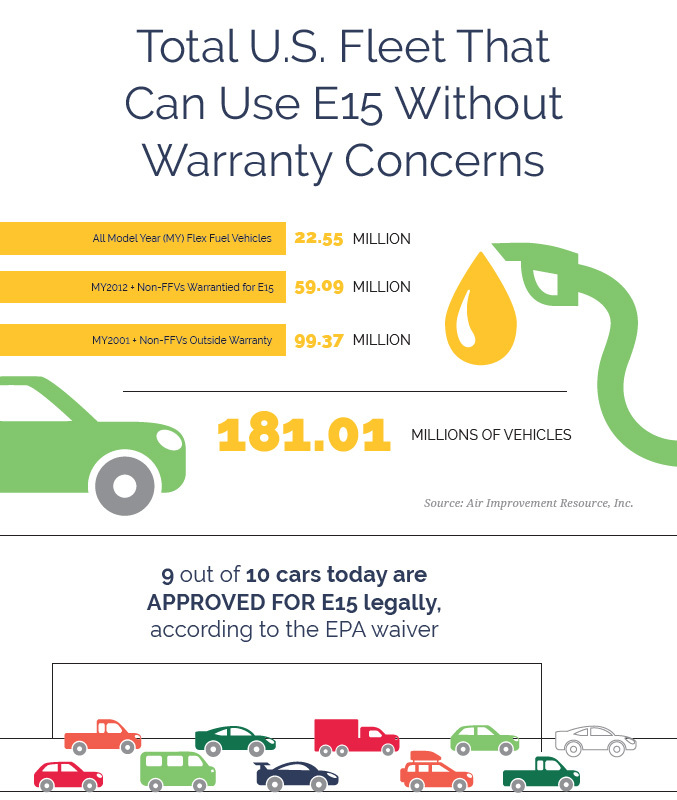 Air Improvement Resource, Inc., which specializes in vehicle emissions and air quality analysis, estimates that about 181 million vehicles in 2018 can use E15 legally and without any concern that it would void the vehicle’s warranty. This fuel choice contains numerous benefits to consumers. E15 may save drivers an average of 5 to 10 cents per gallon, savings that add up over the year. To date, E15 is available at 938 retail locations in 29 states. Beyond the cost savings to the consumer, E15 also brings with it myriad benefits to the environment, the U.S. economy and our energy security, not to mention what it does for rural America and the country at large. E15 is seen as a bridge to providing higher blends in the U.S. Other countries like Brazil have already moved to higher blends. Brazil increased its biofuel blend from 25 to 27 percent in March 2015. Industry advocates also point to the importance of increasing E15 sales to help offset the ongoing grain surplus that is only expected to keep rising. Everincreasing yields and stagnant demand have led to a record world surplus of grain. The 2017-2018 corn marketing year began with a surplus of 2.35 billion bushels of corn, according to the United States Department of Agriculture. Fueling with E15 means a positive step forward on numerous fronts. Visit GetEthanol.com to locate the nearest E15 station and fill up. For more information about E15 and the industry initiative to increase E15 sales, see the Prime the Pump section in this issue.